It’s no secret that falls are dangerous for seniors, but did you know that falls are the leading cause of fatal and non-fatal injuries for senior citizens in America? Or that one in four seniors fall each year? What about the fact that every 11 seconds, a senior is treated at an emergency room for a fall? Keep Moving: According to Mayo Clinic, physical activity is a great way to prevent falls. 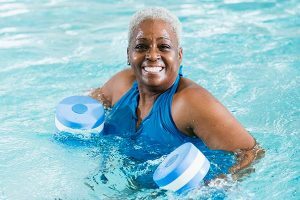 Simple exercises like walking, water aerobics and tai chi all reduce the risk of falling by improving strength, balance, coordination and flexibility. Check Your Vision and Hearing: You might not think of your hearing when trying to prevent a fall, but since our sense of balance is mostly controlled by our inner ear – specifically a structure of bone and soft tissue called the labyrinth – you might want to think twice before putting off your next visit to the doctor. Request that you have your hearing checked at least annually. Your vision might be a more intuitive thought with regards to preventing falls. If you have poor eyesight but are unaware, even the smallest obstacle can prove devastating. A loose cord on the ground or a step you couldn’t quite see are just two reasons you should have your vision checked at least annually. Inspect Your Medication: Not only do many medicines cause dizziness and loss of balance, but according American Bone Health, “people who take four or more medicines are at increased risk of falling.” So, read your labels, check for interactions, and above all else, talk to your doctor about how your medications might affect your balance. Use Assistance: Hand rails, grab bars, walkers and canes are all devices made specifically to help you keep your balance and stay on your feet. These assistive devices and others are your friends – don’t be afraid to use them. There are many ways to preempt a fall. So many, in fact, that here at The Avenues Crofton Park we offer Balance and Fall Prevention classes every month on select Tuesdays at 11 a.m. To learn more about our health and wellness programming, give us a call or take advantage of one of our “open to the public” events by calling 720-799-0915.